A: Loan amount, interest rate, term left on loan, real estate taxes, insurance, borrowers income and house value – All are needed to determine suitability for loan modification. If the lender refuses the modificiation request the borrower has to look to see if a foreclosure is started it will give them more leverage when the lender is forced to go to a judge mandated conference or will it cause them to lose a home that they still have equity in. All cases are different but fortunately many judges are making unreasonable lenders listen to good faith modification proposals before allowing a foreclosure to proceed. Contact your local bar association for a list of attorneys who do modifications in New York. If you can’t afford a lawyer many local not for profit legal services offer homeowner assistance programs. Steven T. Decker is an experienced real estate lawyer, author and speaker. With over 20 years of experience, Steven represents individuals and investors in the purchase of residential and commercial real property. 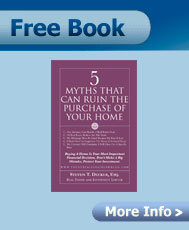 Steven is the author of “The Five Myths that can Ruin the Purchase of Your Home” and he is the publisher of the “New York Real Estate Law Blog”. If you are buying or selling a home or commercial property in Staten Island, New York City or New Jersey contact Steven T. Decker, Esq. to discuss the services that he offers and how his legal representation will assist you.